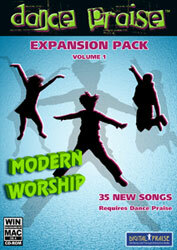 Modern Worship expansion pack adds 35 new modern worship songs to Dance Praise and Dance Praise 2! WIth the astounding success of the original Dance Praise, Digital Praise has now released Dance Praise 2: The Remix! Widely acclaimed by reviewers, Dance Praise 2: The Remix is packed with 52 new songs, many new features, and compelling 3D graphics, that is sure to get the entire family off the couch and dancing in no time! Now you can add another player to the party with this extra controller that plugs directly into any USB port on your computer, for both PC and Mac. Ideal for players of all ages. With 3 sets of dance steps per song, that's over 100 new dances for hours of movement and worship! Features music from hit Modern Worship recording stars, including Matt Redman, Chris Tomlin, delirious?, ZOEgirl, and Steven Curtis Chapman, as well as tracks from new and emerging artists. Requires Dance Praise and one or two interactive dance pads. When you install it, the new songs are automatically integrated into your Dance Praise game. Works with the original Dance Praise and Dance Praise 2: The ReMix.